This entry was posted on May 6, 2016 by admin. It has been more than three decades since a US cargo flagged ship has gone down during a voyage. However, on October 1, 2015 at 7:20 am the cargo ship, the El Faro, placed a distress call stating that the ship had become disabled. Sometime after that it tragically went down near the coast of the Bahama island Crooked Island due to hurricane Joaquin. The vessel was on route to Puerto Rico carrying cargo from Florida. It was recently reported by the Coast Guard that a second trial is going to begin on May 16 and run until May 27, being conducted by the Marine Board of Investigation. This second round of hearings is going to specifically target the operations protocol that took place on board, attempting to reveal if there was any oversight on the part of the ships process, including but not limited to cargo loading, lashing and stowage operations and the forecasted weather conditions prior to departure. These hearings will help draw a conclusion on what did in fact cause the El Faro to sink and if any misconduct was committed by the crew, who all tragically perished in the wreck. As some members were licensed or certified, the investigation will help determine if there was disregard to the law or intentional misconduct among any parties, which may have further aided in the ships demies aside from the three-day long storm. 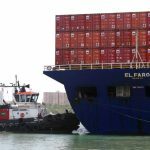 Although the National Transportation Board and Safety (NTBS) has launched its own extensive investigation into the El Faro, it is said that they will also be participating in the hearing during this time. Luckily a key piece of evidence has finally been discovered that will be paramount to obtaining some answers in this accident, which prompted the announcement of yet a third trial. The voyage data recorder (VDR), was found nearly three miles below the surface by NTBS on April 26, 2015. The date of this third trial has not yet been set to the complexity now involved in retrieving the VDR. This third hearings’ full intentions are going to focus on the evidence gathered from the VDR if and when it is successfully recovered. It is also said that USCG plans on further looking into some additional information that has been brought to light. They will be calling TOTE company offices as well as newly found crew witnesses to possible put an end to this tragedy.